It is a well known fact that in nature only the fittest survive, the fittest and the most easily adaptable. This “rule” of nature encompasses everything, including people. We have seen this rule put to the test time and time again throughout history, and those people or animals that couldn’t live up to the challenge of nature, or their fellow man- kind, fell away into extinction. In fact, we have seen this very thing happen pretty recently. When Columbus discovered America, all the Native Americans were immediately put to the test, trying to cope with white diseases, new ideas, foreign weapons, and everything else that followed the first European explorer to America. Many tribes were pushed to extinction by European pioneers, either killed by the foreigners or each other. In proportion to the number of tribes before the time of Columbus, today there are very few surviving Indian tribes, and most of those are only a fraction of their former glory. One of the Indian tribes that have managed to hang around are the Apache Indians. The Apache have had perhaps one of the most trying existences, yet they have survived to hurdle over all obstacles. This is a reflection on the strength of their character and shows the durability of the people. Although the Apache people have lived in what we know as the United States for the past few hundred years, they originated from the northwestern corner or North America, the western Subarctic region of Alaska and Canada. The Apaches actually broke away from the Athabascan speaking tribe of Canada and were the first band to migrate as early as AD 850. The Apache were used to living in mountainous areas and followed the Rocky Mountain range down to the Southwest U.S. in about 1500. Food in the Subarctic region wasn’t very dependable; the climate didn’t allow for too much agriculture and the availability of game varied with the seasons and climate. In order to survive the Apache had to constantly move from place to place and this characteristic of the tribe continued with them even after they migrated south. the spoils captured in raids on other Indians, wagon trains, and settlers. As the Comanches moved onto the buffalo hunting grounds, they pushed the Apache south, causing them to lose their main food source and to rely more heavily upon raiding, trading, and farming. Raiding had been something the Apache had only done once in awhile but now that they couldn’t hunt buffalo any longer raiding became necessary for their survival. The hostility between the Apache and the Spanish settlers increased when New Mexico became a Spanish colony. Because of Spanish interference the Apache relied more heavily upon other food sources and they would raid other tribes or Spanish settlers to get the supplies and food they couldn’t acquire on their own. 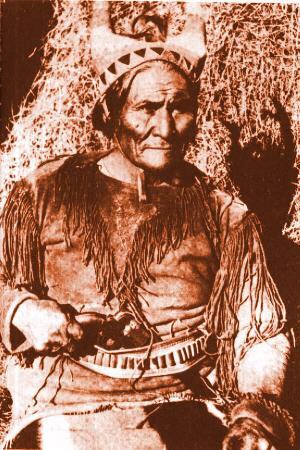 Raiding other people, whether Indian or European, became a major part of the Apache survival. When the Apache raided other groups they didn’t stick to just crops, they also took livestock which they later sold; this became the main source of income for most Apaches. Because not everyone owned cattle to sell or trade there were members of the tribe who were poor, though they were never in any danger of starving to death. A tribal fund was usually created so that the less fortunate members of the tribe would still be able to survive even though they had no cattle. It’s just been recently that the Apache have been adapting to modern world and accepting some of the “whiteman’s” ideas. Although life on the reservations is now a little easier than when the Apache first moved to these designated lands, a very big majority of the Indians are still living in poverty and unemployment is no stranger. This does not mean that the Apache are still farmers trading livestock with one another. In fact the Jicarilla Apache tribe owns thousands sheep, a large number of horses, and fewer cattle and earn a lot of income from wool sales. They also get a pretty big amount of revenue from hundreds of oil and gas wells on the reservation. There are also the White Mountain Apaches in Arizona who run the Sunrise Ski Resort and the Fort Apache Timber Company; then there’s the family operated ranch that provides game hunting on the Mescalera Apache reservation. There is a fraction of the Apache Indians who do manage to break out of poverty and carve out a good life for themselves but these few Indians don’t represent the rest of their tribe members. Many would say that the future of the Apache Indians doesn’t look too bright but this is just the beginning, not the end. The Apache are strong people and although they are struggling now they will eventually begin to prosper. More kids are staying in school and learning the importance of an education and the result of that will show in future generations. People are finally beginning to recognize the some of the problems that these kids are having. Children on the reservations don’t take school seriously, they start drugs at a young age, some drop out of high school and not many move on to college. Kareem Abdul Jabbar is setting a great example for us all. He wants to see these kids doing better in school and he’s taking action. Kareem Abdul Jabbar has agreed to coach basketball at the White Mountain Apache’s high school for the sky-high price of $1 a year. You see, he isn’t doing it for the money, he’s doing this because he realizes that these kids need some sort of motivation to keep them in school and he’s willing to give them that. With help like this the Apache people can make a better life for themselves, it’s just a matter of time. The Apache have been around for a long time and will continue to prosper for years to come despite what problems they may face.